If you are looking for a dentist in Kennesaw who provides restorative dental procedures including crowns and bridges, we can help. We are Kennesaw Mountain Dental Associates, a comprehensive family dental practice serving the community of Kennesaw and the surrounding areas. Crowns and bridges are restorative dental procedures that can be used to restore the form and function of your teeth and improve your smile. 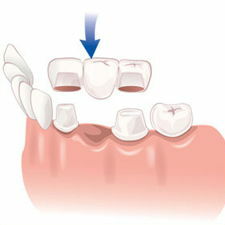 A crown is used to fully cover the portion of a tooth that lies at and above the gum line while a bridge spans the space where teeth are missing and attaches to the adjacent teeth. Our dentist, Dr. Hamir Contractor, has extensive knowledge, expertise and experience in placing both crowns and bridges. For top quality dental care including crowns and bridges, residents of Acworth can trust the professionals at Kennesaw Mountain Dental Associates. If one or more of your teeth is broken or chipped, or if you are currently missing teeth, schedule a consultation with Dr. Contractor today. He will diagnose your situation and determine whether a crown or bridge may be a good solution for you. At Kennesaw Mountain Dental Associates, patients come first. We are committed to helping our patients achieve a great smile and healthy teeth and gums. The dentist and staff from our Kennesaw dental practice are dedicated to delivering the highest quality restorative dental care in a warm and friendly environment. Our dentist is highly trained to provide in-office sedation dentistry to keep our patients relaxed and comfortable during dental procedures. If you live in Marietta and are in need of restorative dentistry such as a crown or bridge, please contact our Kennesaw Dentists For Crowns/Bridges today to schedule an appointment. Kennesaw Mountain Dental Associates is currently accepting new patients and we accept most forms of dental insurance. We also accept credit card payments and offer financing options for your convenience. 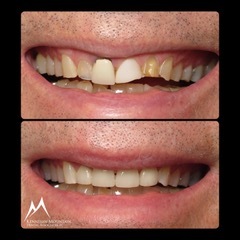 We look forward to meeting you and to helping you achieve your best smile.